Please Note - PUBLIC RANK TAXI FARES ARE CONTROLLED BY THE DVS AND THE METERS ARE SEALED. Altogether there are three numbered tariffs used by Public Rank Taxis. These tariffs are automatically set by the Taximeter and not the driver. Un﻿like private hire cabs whose tariffs are lettered A, B and C.
Private hire cabs companies also set their own fares and charge a percentage above our tariffs for pre-booked journeys. Please read tariff card below for the average percentages charged above public rank fares. Public Rank Taxis tariffs are numbered 1, 2 and 3 displayed clearly on every taximeter so the customer can see what tariff they are on. These tariffs are applied automatically on all public rank taxis and cannot be set by the driver as their meters are sealed by the Jersey States (DVS) Department. Tariff 1 and Tariff 2 are the main two tariffs that are applied for day and night hire throughout the week, the exception being tariff 3 which is used only on Christmas Eve and Christmas Day, Boxing Day and New Year's Eve and New Year's Day. 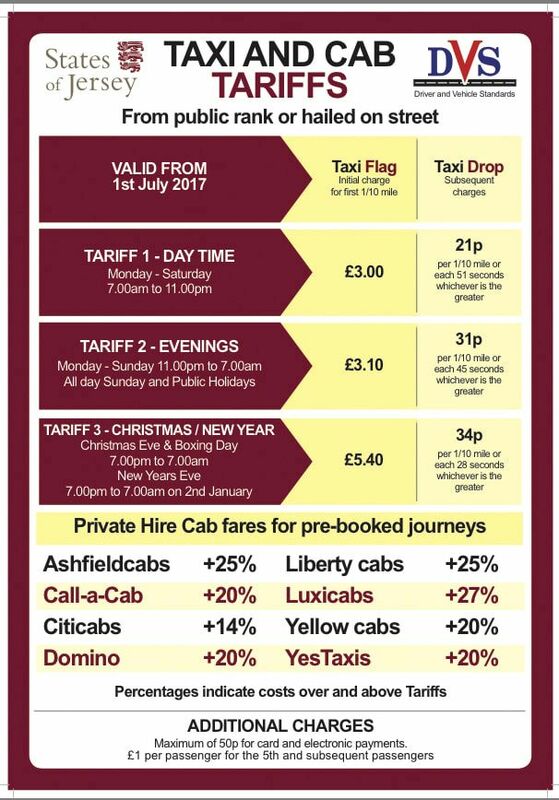 ​See below the 'States of Jersey' tariff card showing the charges for all 3 tariffs for 'Public Rank Taxis' and the comparison percentage above these fares applied by 'Private Hire Cab Companies' for pre-booked journeys. across the board for all Taxi Cabs from October 2018. This 1p will be added to the flag price and the drops. The new card will be shown as soon as the SoJ publish it. How to tell the difference between a Public Rank Taxi and a Private Hire Cab. There are two types of taxis on the Island, Controlled (Taxis) and Restricted (Cabs). 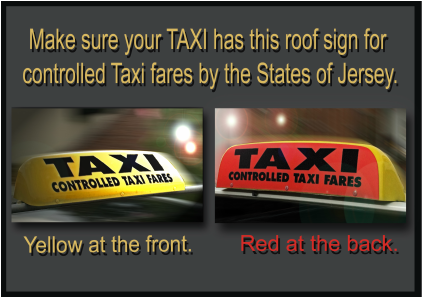 The main difference between the two is that Controlled Public Rank Taxis have a roof sign that just says TAXI and CONTROLLED TAXI FARES. Recently the DVS has changed the back ground colour of the roof signs to purple for new entries onto the public ranks but the sign still has the word TAXI on the front and back. Some manufacturers of purpose built taxis have the signs built into the vehicle and may look like this with just the word TAXI on the front. Remember that Public Rank Fares are controlled by the (DVS) the difference in price can be considerable and in some cases it has been reported that 'Private Hire Cabs' have charged more than double the price of a Controlled Taxi. 'So why pay so much more for the same journey?'. It is advisable to always ask the Taxicab driver for a receipt in case of any complaints or queries you may have on a taxi fare as it can only be dealt with if a receipt exists. Also get the drivers PSV badge number he should have it displayed, if not ask for it.